The City of Carmel sent letters out to Home Place residents to outline the timeline for services being provided for the 1,017 square acres of previously unincorporated land centered at 106th Street and College Avenue. In October 2017, the Indiana Court of Appeals upheld a decision to allow Carmel’s annexation of Home Place. In November, the city reached an agreement with the group Concerned Citizens for Home Place to allow Carmel to proceed with annexation after Jan 1. Carmel set annexation date for March 1, meaning the city has until March 1, 2019, to begin providing operational services such as police protection and plowing snow. Previously, the county provided these services. The yearlong delay in providing services is to allow tax revenue to be collected to fund them. Some services will start immediately, such as trash pick-up. Carmel Mayor Jim Brainard explained the process in a letter dated Feb. 27. Brainard said over the next few years that he and his staff will be seeking input from Home Place neighbors about street and other improvements. The city will begin focusing on code enforcement by doing a block-by-block analysis of issues and address worst offenders such as absentee landlords that have allowed junk to accumulate and properties to deteriorate. Some street trees that pose a risk to public health or safety will be removed from public rights of way. The city will also do a review of commercial properties to determine which areas could benefit from improvements made by the Carmel Redevelopment Commission. Trash and recycling. Services became available March 1 for those who do not have a contract that can’t be canceled. By 2019, everyone will be on city trash service. Water. Carmel Utilities continues to provide water. Nothing changes. Stormwater. Residents begin paying a stormwater fee immediately. Code enforcement. Property maintenance services will begin immediately. Sanitary sewer. Remains with Clay Regional Waste, so nothing changes. Police. CPD will begin patrols, respond to calls, conduct crime investigations and more in 2019. Until then, the Hamilton County Sheriff’s Office will continue to provide services, although CPD will continue to assist in emergency situations. Streets. In 2019, the Carmel Street Dept. will begin painting lines and markings and convert streetlights to LED. Some signs will be replaced, and there will be minor repairs on storm sewer drains. Carmel also will sweep the streets, mow the right-of-way and remove snow. 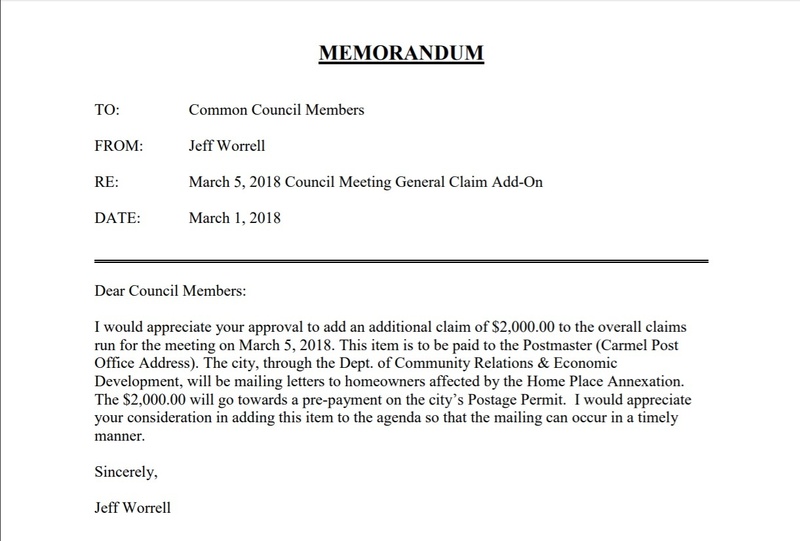 Well Now, Carmel’s 10-year Fiscal plan is short postage for Home Place Annexation Mailing. Home Place was conquered, not annexed.